The day was hot, the night was cold. Â On the main stage in the sunny afternoon Claire Jenkins accompanied by Joe Phillips sang a lovely song to blueberry lovers. Craig Cardiff wowed the crowd, Jory Nash told lots of good stories, and Lenny Gallant roused the crowd with his modern folk, accompanied by searing violin. In between acts as the Main Stage was setting up were impressive: a young Australian Kim Chuchill roused the crowd, and Cindy Doire wooed with songs sung in French. 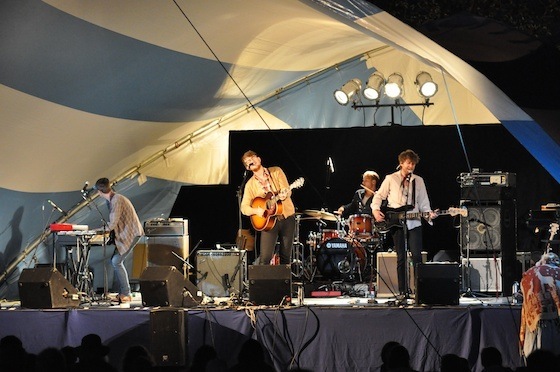 The band that got them dancing was The Wooden Sky, followed by John Booth & The Southside Band. Â After the mainstage, the fire circle was crowded, and lasted as long as the clear cool night.